Brief: to reimagine out of town shopping destinations from 2030 and beyond. The design will feature a mix of retail, food and leisure units. 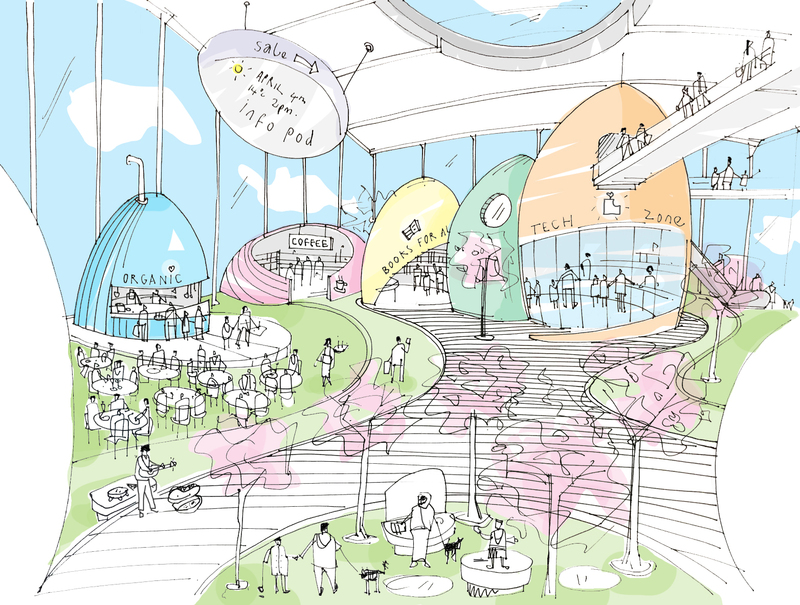 The design should also consider the important role of high-quality public realm, the increasing impact of tech in retail, its connectivity, the environmental and social sustainability of the scheme and the experience created for shoppers. 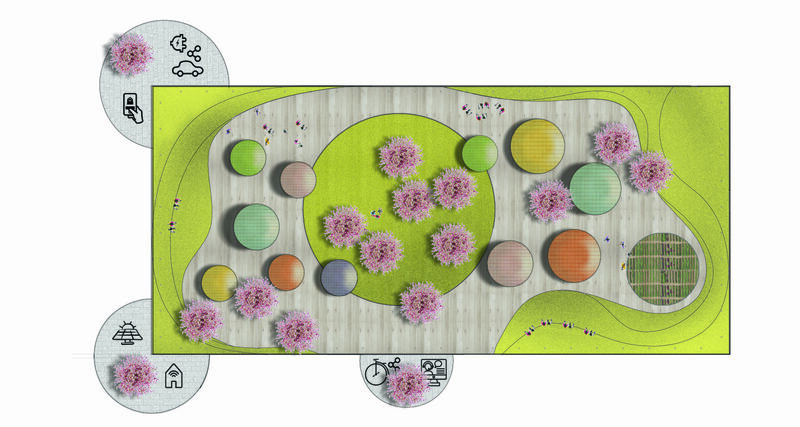 Our concept centred on the social experience of a park, or square or piazza; that feeling of connectivity and coming together that we sometimes feel. Our aim was to create a community in which people can work, shop and be together. First we introduced playful shapes, colours and relaxing corners to allow the consumer to develop the right state of mind to shop. The building is conceived as an enclosed square space: a flat portal frame of transparent glass curtain walling, opaque or reflective smart glass depending on the area. The roof is covered with solar thermal and photovoltaic panels, providing sufficient power for the entire building. A large roof light or window allows natural light to enter, creating a pleasant shopping environment for customers within and sustaining trees and green areas below. Through new technology, the building will be able to balance itself – rainwater is harvested for use in the allotments and water appliances and waste is recycled and reused. We imagined 2030 as a time when sustainability will be central to each purchase we as consumers make, we will have a concern for where an item was produced and how far it has travelled. For this reason we designed each egg to contain two distinct levels, an area for production (an artisan laboratory) and one for displaying sale goods. We included an area for growing vegetables, allowing farmers to use their allotments to harvest and sell directly to the bar and restaurant units nearby. The retail park will be a destination not only for consuming, but for spending free time, enjoying the spaces, facilities and harmonious surroundings.